NAPERVILLE, Ill., Oct. 18, 2017 /PRNewswire/ — Digi-Me, a digital recruitment firm specializing in tracked video technology for the modern-day employer, announced today that it is now offering custom branded landing pages that host all Digi-Me digital recruitment videos, including video job ads, cultural videos, and candidate expectation videos. With Digi-Me’s landing pages, clients now have a single web URL that houses all recruitment video content. This makes it extremely easy for HR and recruitment professionals to share their openings with their current communication and sourcing methods. It is a perfect solution for internal employee referrals and social media recruitment. Further, Digi-Me landing pages offer higher SEO (Search Engine Optimization) since it is a single page with all of one company’s branded recruitment videos and it is mobile optimized. This solution is very turnkey, as it will allow easy implementation on all requisitions and every time a new job is added to the appropriate category section of the Landing Page. Newell Brands plans an expanded roll-out which will include a Digi-Me Landing Page for select, hard to fill jobs, designed to improve brand awareness for their candidates. 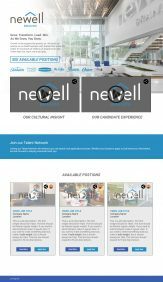 “Providing information about our company via video has proven to be a valuable way to communicate with our recruits and our partnership with Digi-Me has provided some fantastic results that we’re excited to build upon,” said Bruce MacLane, Head of Global Talent Acquisition for Newell Brands. Digi-Me is the only company of its kind in today’s marketplace. Digi-Me is revolutionizing the talent acquisition industry with video technology that is easy to share on social media, easy to view on a mobile device and boosts SEO ranking. With Digi-Me’s proprietary technology, the company is able to offer real-time data and metrics on where their recruitment videos are being viewed, socially shared, where applications are coming in by source, and in most cases, tracking source to hire! With a combination of all the aforementioned features, Digi-Me clients are reporting a reduction in cost per hire of over 50%! Aureon Staffing, who has seen tremendous results from working with Digi-Me. Aureon reported that the company has increased traffic to their job postings, gone viral on social media, and have attributed 240 new hires as a result of using digital job videos since it began using the recruitment videos just in the first 8 months of usage! Resulting from their increased traction, Aureon has saved $1.9 million plus in recruitment costs.